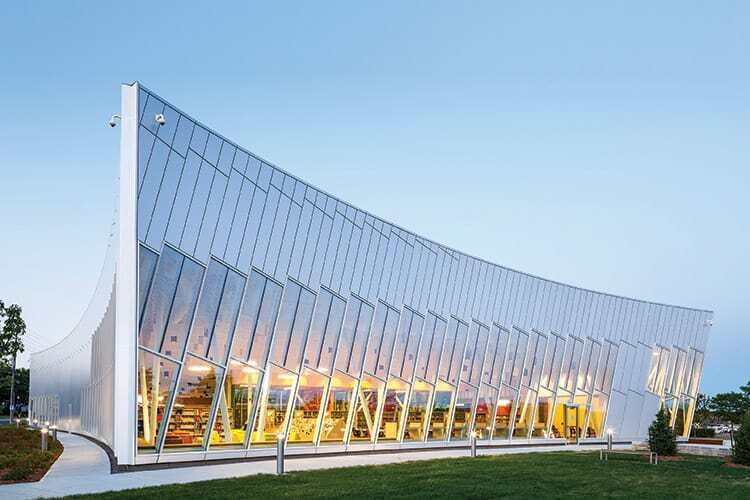 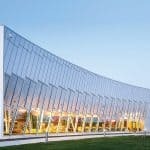 The Vaughan Civic Centre Resource Library’s sloped exterior cuts an impressive figure across the Canadian sky. 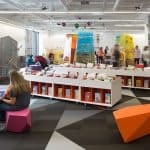 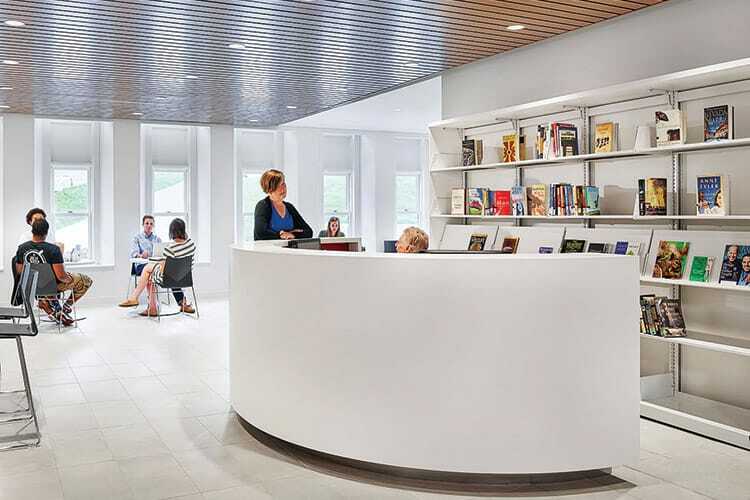 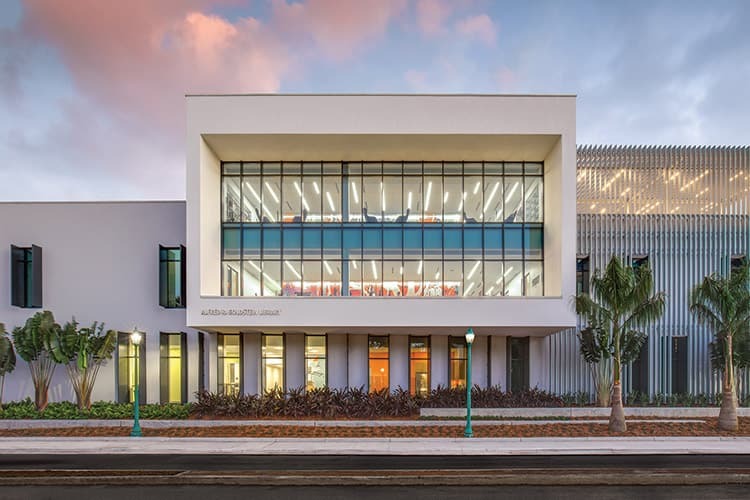 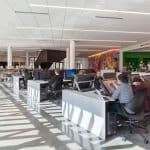 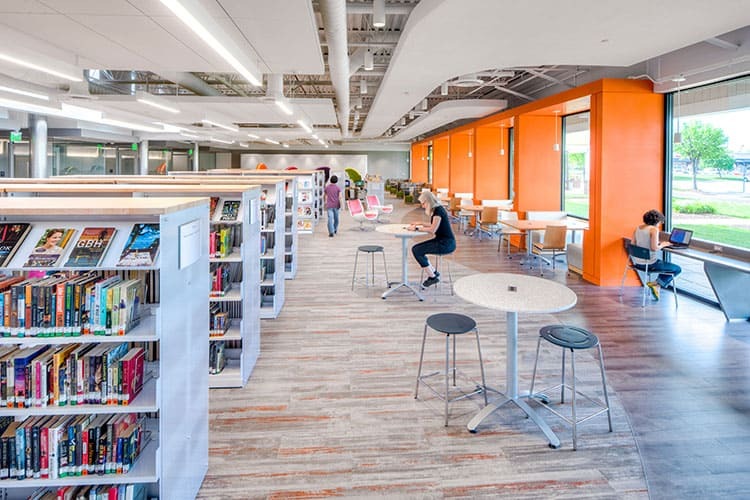 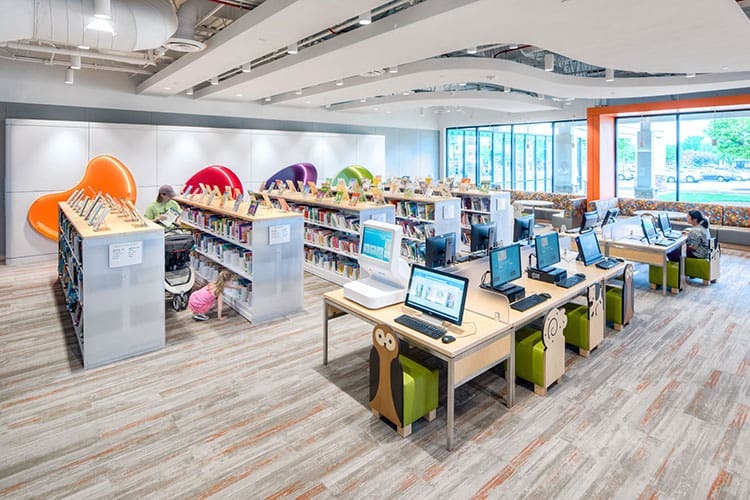 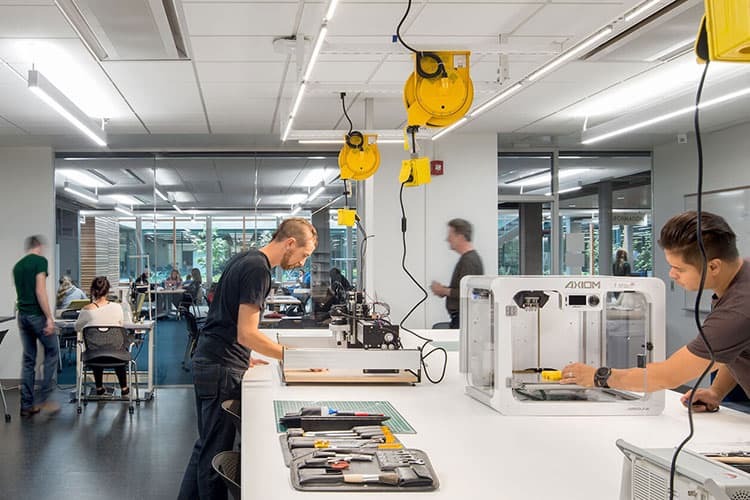 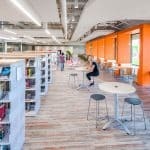 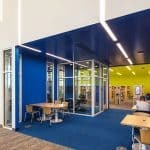 Inside the two-story facility, a plethora of tools for 21st-century learning—3D printers, a media suite, and audio and video recording studios—are available, while movable book stacks allow staffers and patrons to morph spaces to suit their needs. 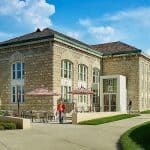 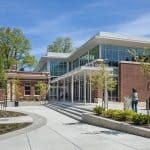 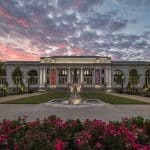 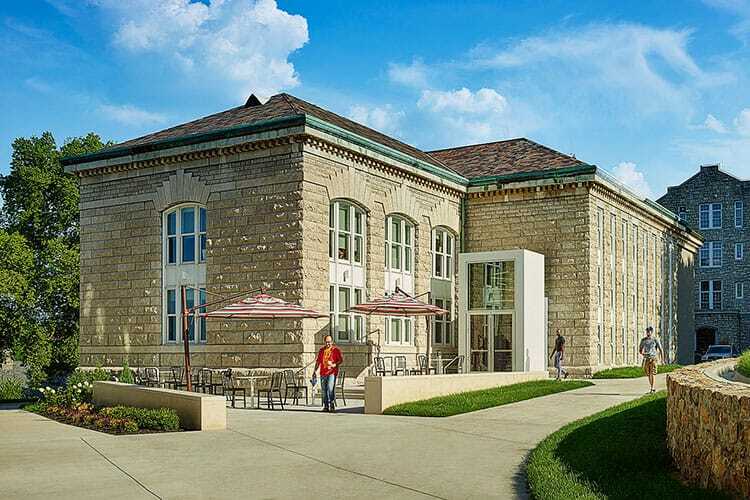 Built in 1906, Norrington Center—the oldest Carnegie library remaining on a college campus in Missouri—is now a state-of-the-art academic commons that serves as a library and meeting place for the university. 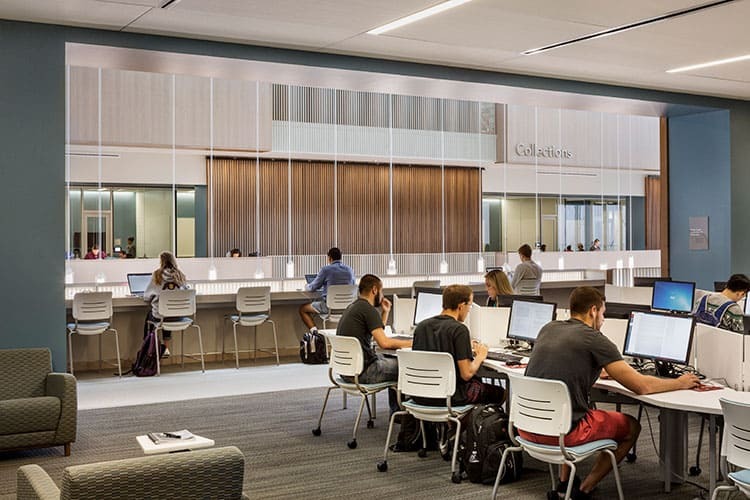 Renovations added collaborative and quiet areas, tech-enhanced classrooms for distance learning, and a coffee shop. 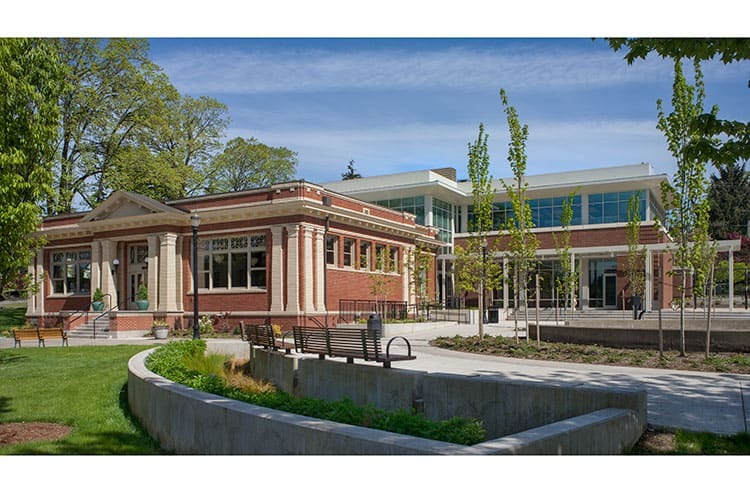 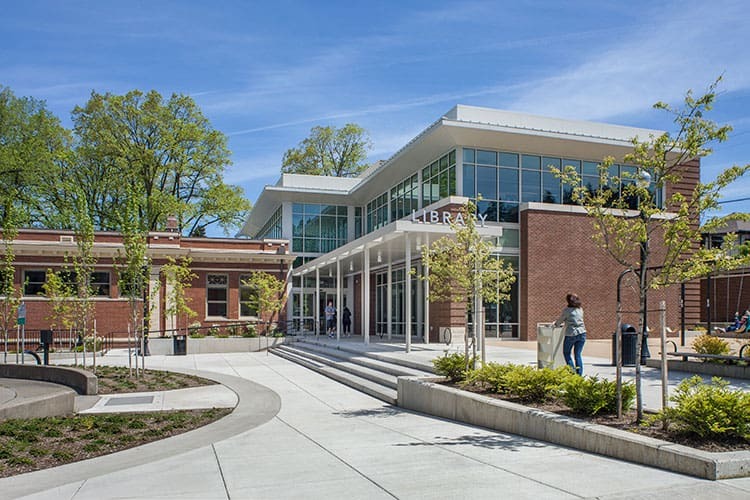 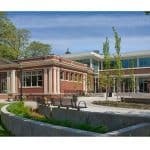 Oregon City’s 104-year-old Carnegie library, which is listed in the National Register of Historic Places, received a massive face-lift that increased its size threefold while maintaining its historic charm. 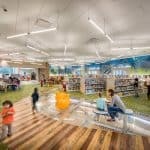 The additions include a centralized entryway, a new children’s section, a reading room, community spaces, and increased tech capabilities. 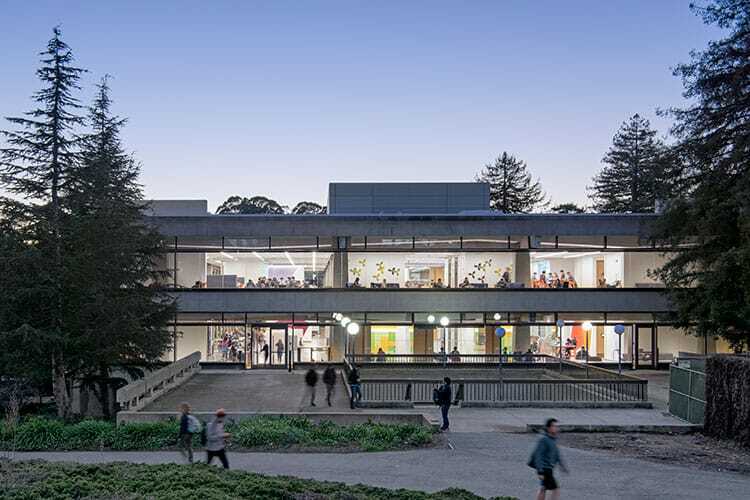 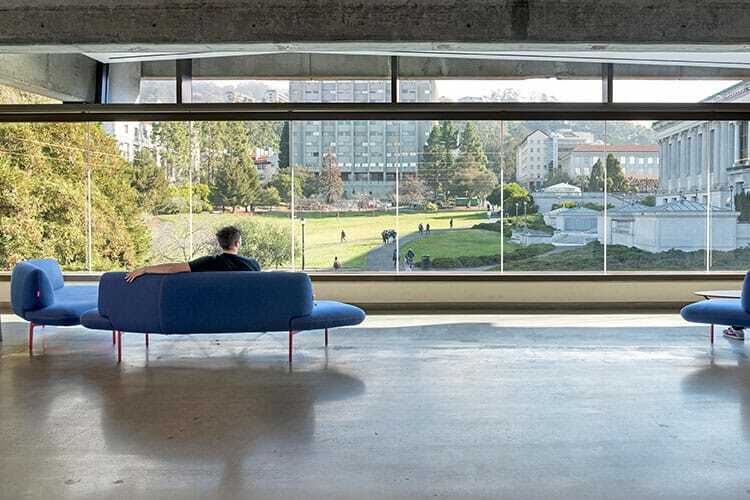 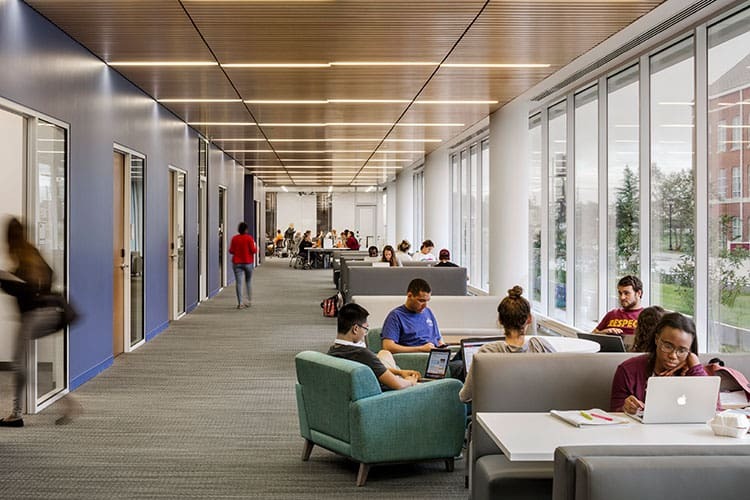 Designed in the late 1960s, the James K. Moffitt Library’s fourth- and fifth-floor renovations brought the library into the 21st century, with the addition of studios for audio and video recording, a wellness room, and a gender-neutral restroom. 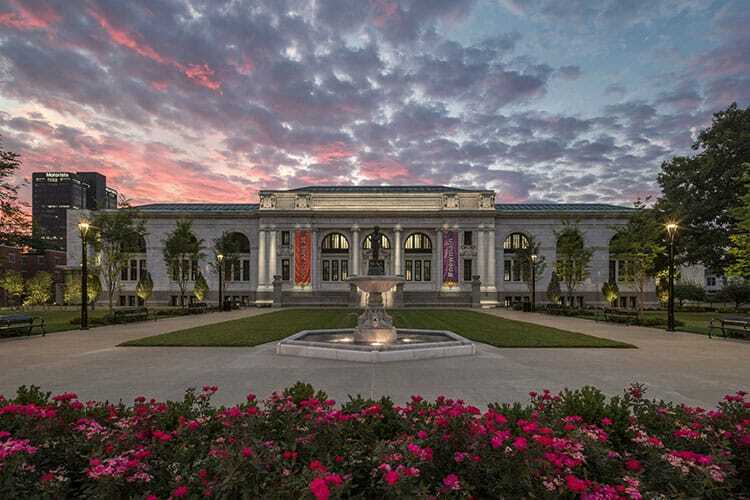 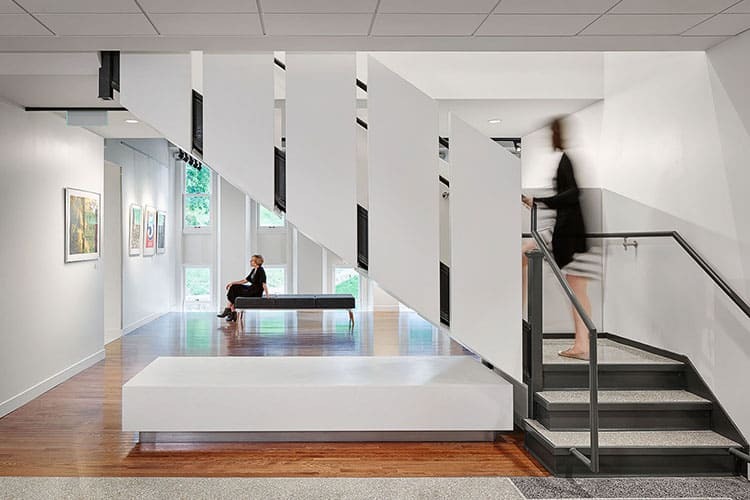 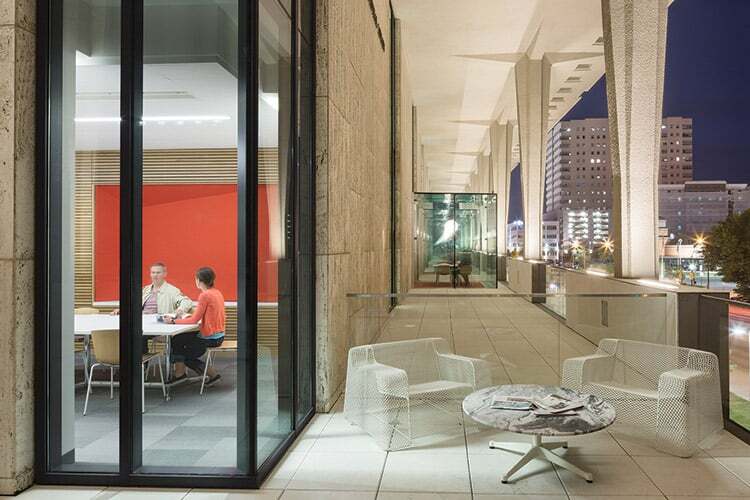 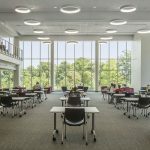 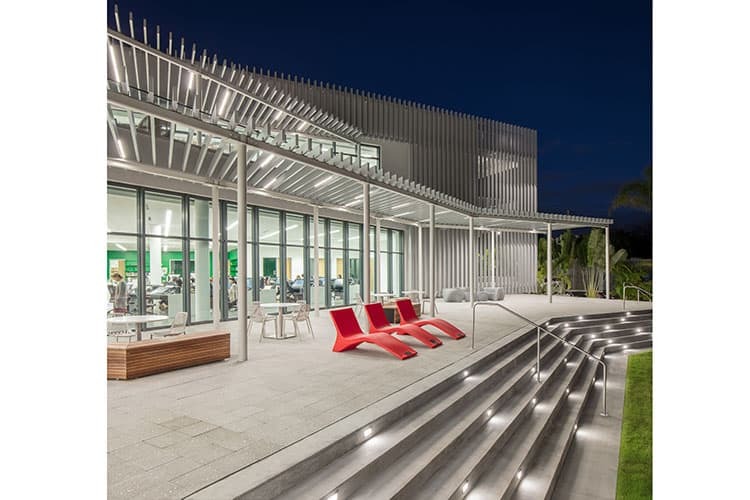 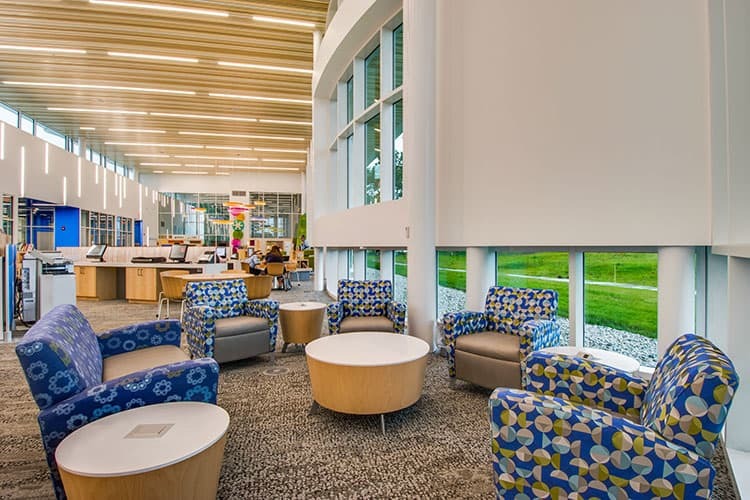 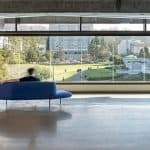 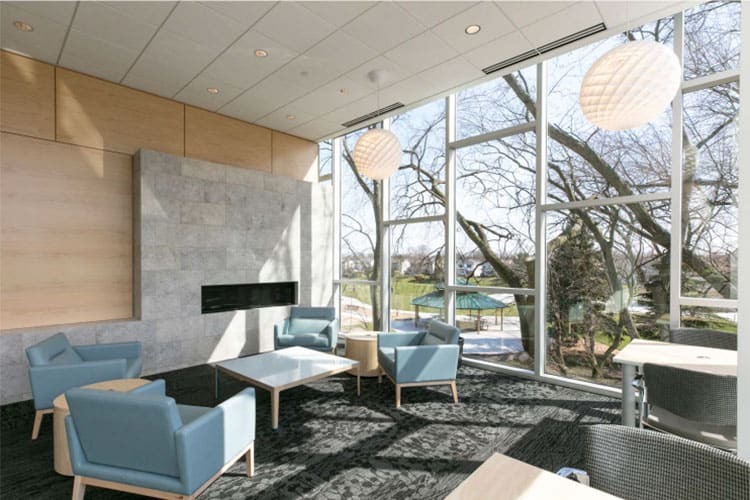 Accessible 24 hours a day, the spaces were designed for maximum natural light exposure, allowing for outdoor views throughout the building and decreased lighting expenditures. 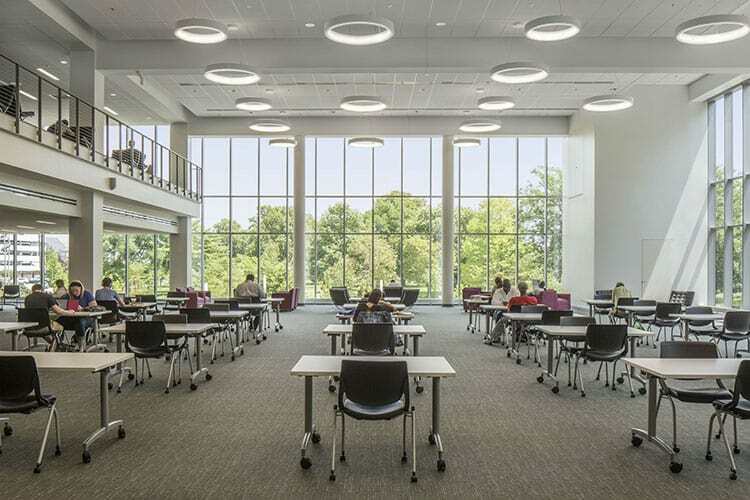 Salisbury University’s new academic commons consolidates the university’s academic support programs into one facility that also houses the library, classrooms, a café, a 400-seat assembly space, and the Nabb Research Center—a special collections library dedicated to the history and culture of Maryland’s eastern shore. 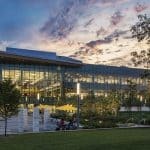 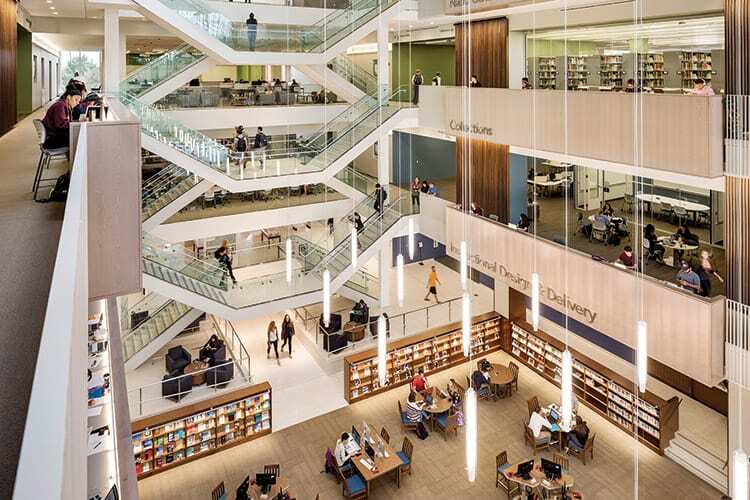 Nearly five times larger than the college’s previous library, this new facility was built with a focus on art and design education. 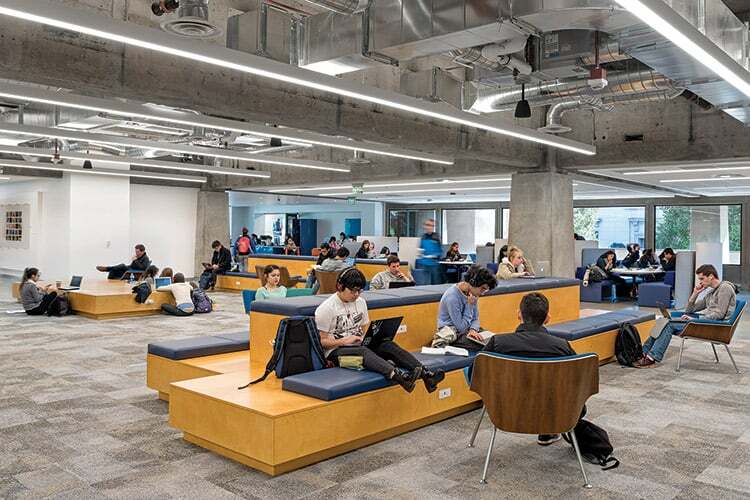 Ten group study areas, a special-projects workroom, and four terraces used for gatherings and as sketching spaces are complemented by iconic examples of furniture design by Eames, Heatherwick, and Gehry. 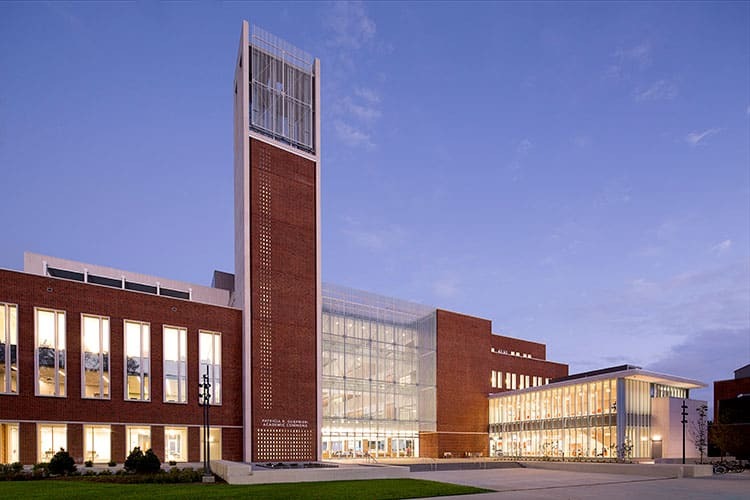 Rising above the concrete plaza in the heart of the university’s Lorry I. Lokey Science Complex, the renovated commons and research library now offers specially equipped, discipline-specific rooms for chemistry, human physiology, physics, geology, computer science, and biology studies; a big-data visualization lab; group-study areas; and a makerspace. 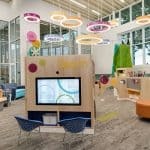 Indian Trails Public Library’s renovation and expansion provides more space for a colorful youth area, makerspace, and training lab. 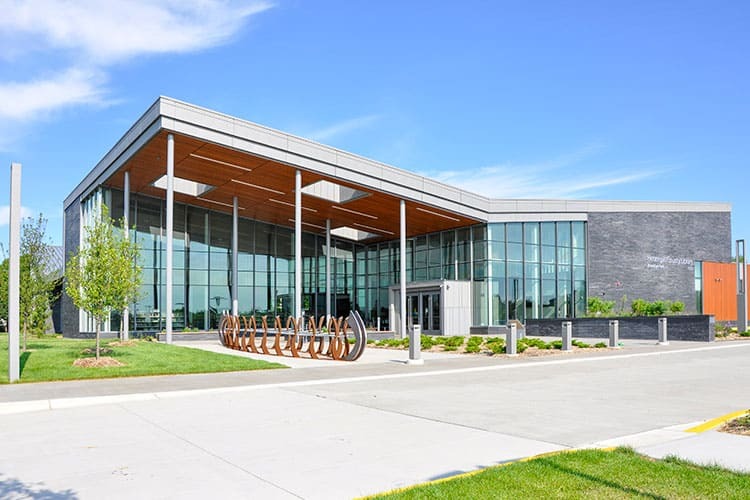 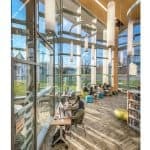 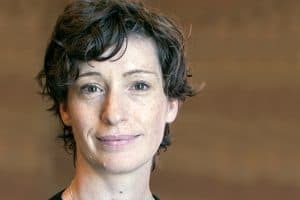 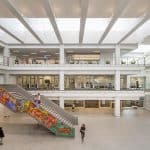 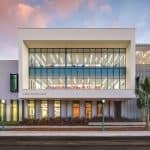 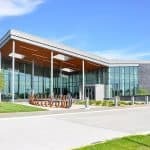 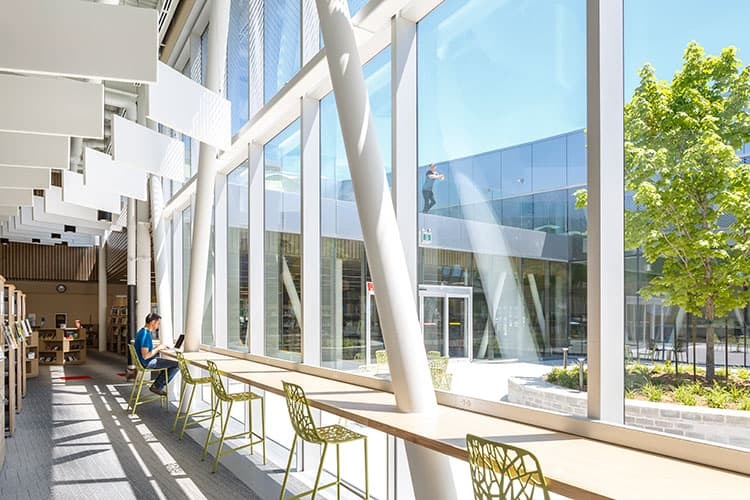 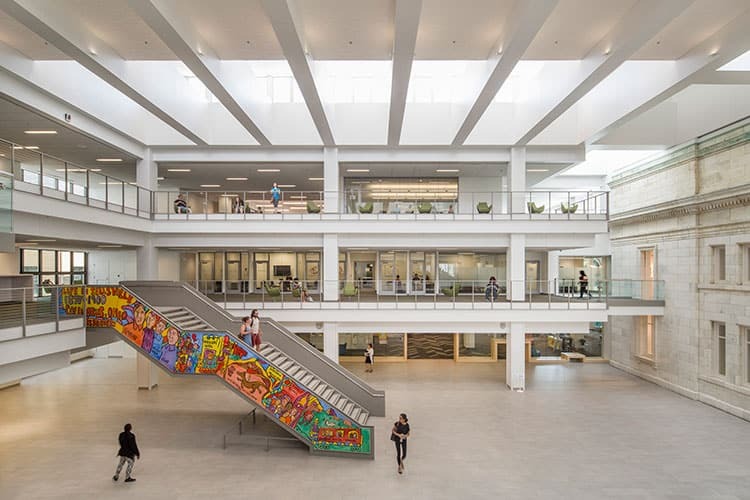 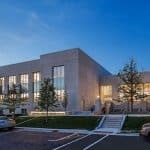 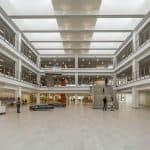 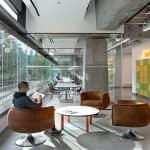 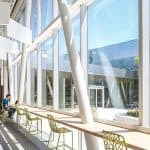 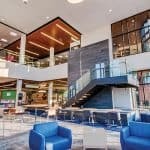 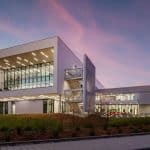 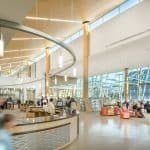 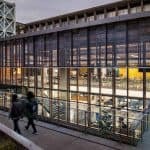 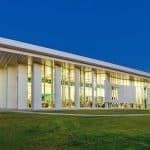 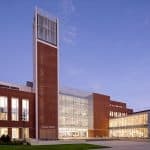 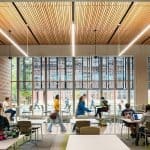 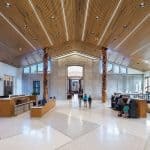 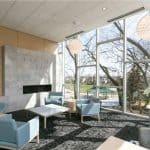 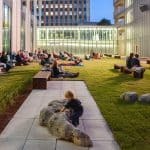 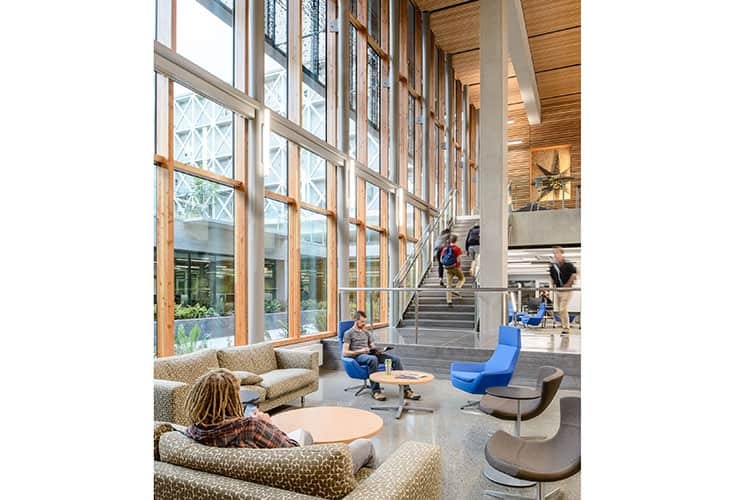 Green improvements include a geothermal heating and cooling system, natural gas water heaters, and LED lighting that spills through the building’s large glass wraparound windows. 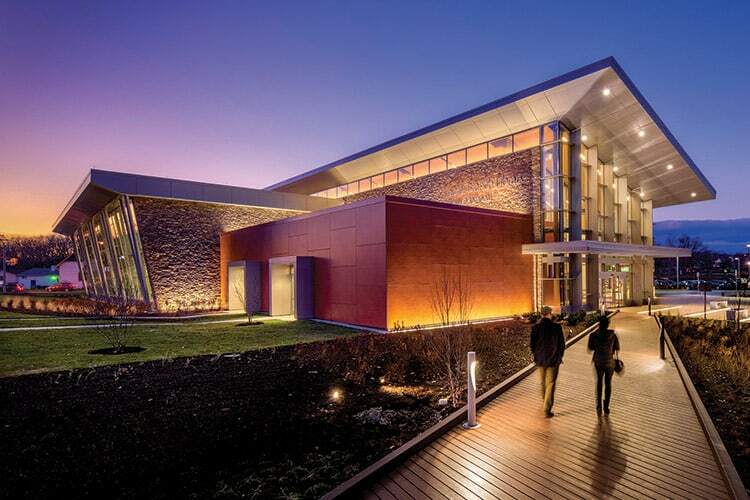 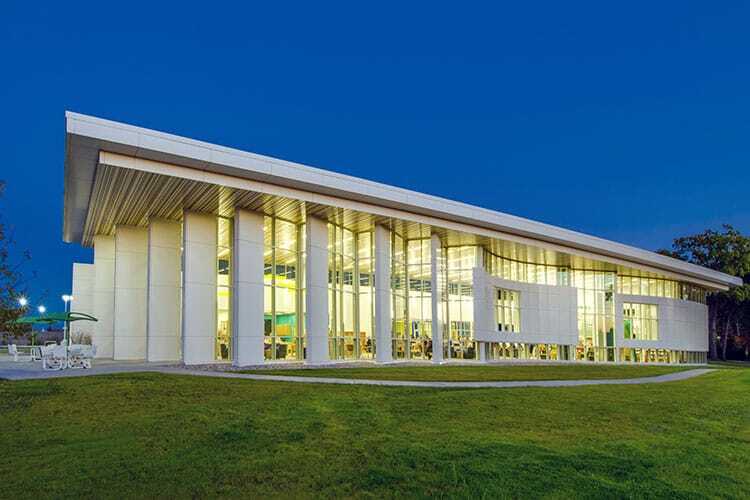 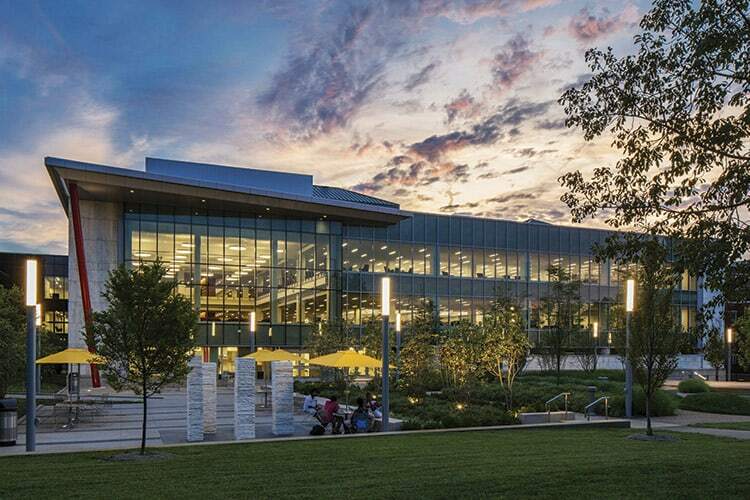 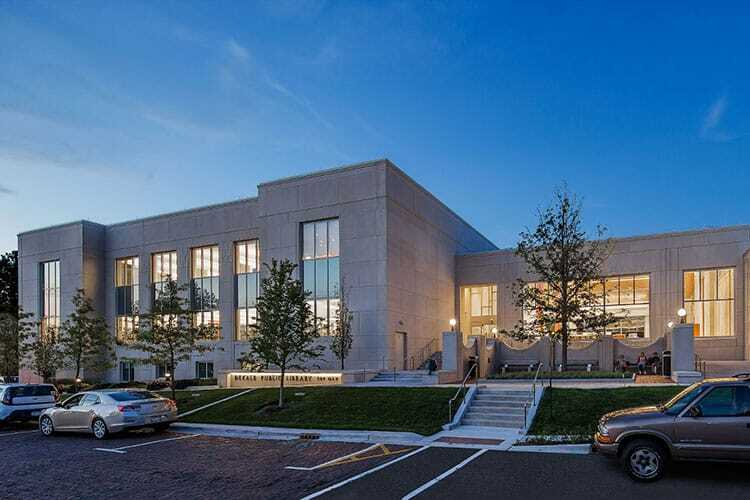 The new Laurel Branch Library’s glass façade illuminates the night sky and nearby Emancipation Community Park, which was renovated in conjunction with the library’s construction. 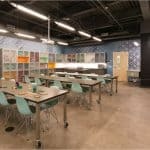 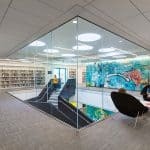 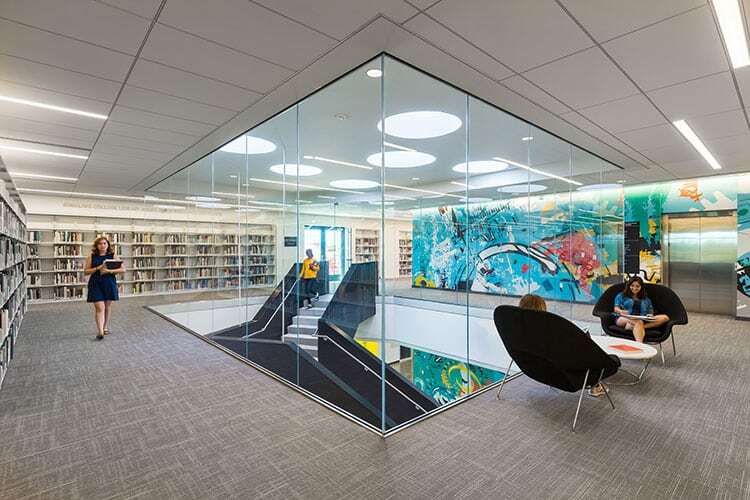 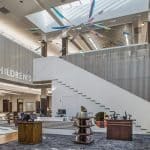 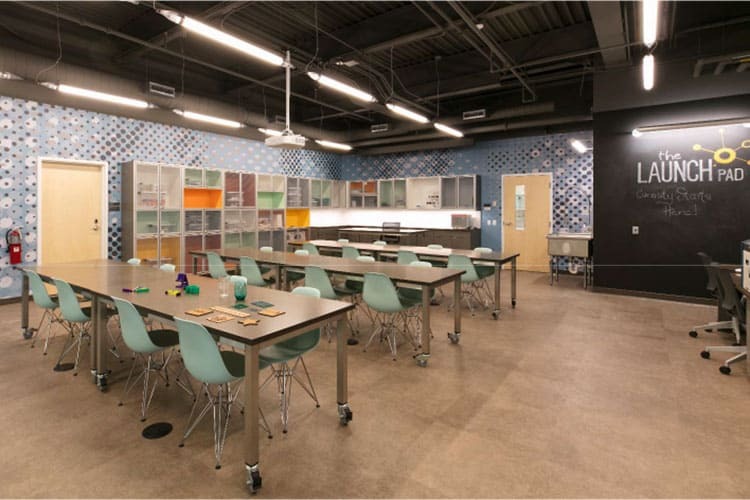 An open interior allows easy access to technology and tutoring spaces, and the kids’ section includes a replica of an archaeological dig site encased in the glass floor. 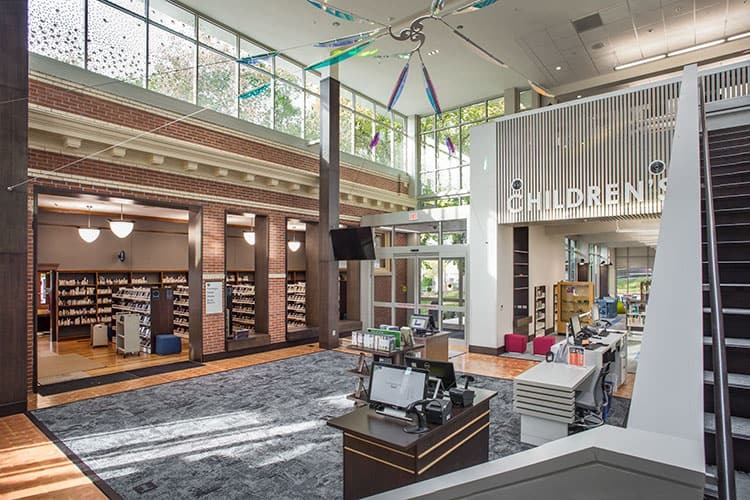 The King Road branch library’s airy new facility provides plenty of room to display materials in a manner mimicking a retail space, while also housing a 182-person meeting room, flexible meeting spaces, 14 computers, a studio with audio recording capabilities, and a garage for four outreach service vehicles. 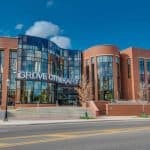 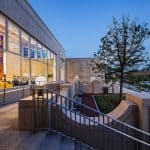 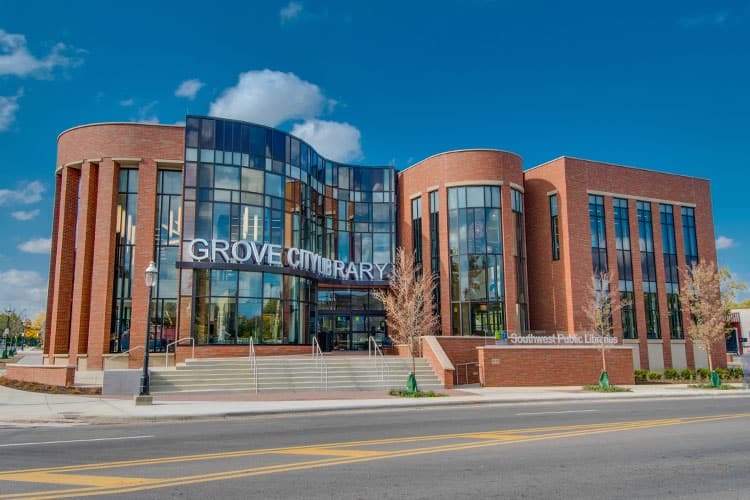 Grove City Library’s terraced plaza with floor-to-ceiling glass windows provides a large open space for patron and community gathering. 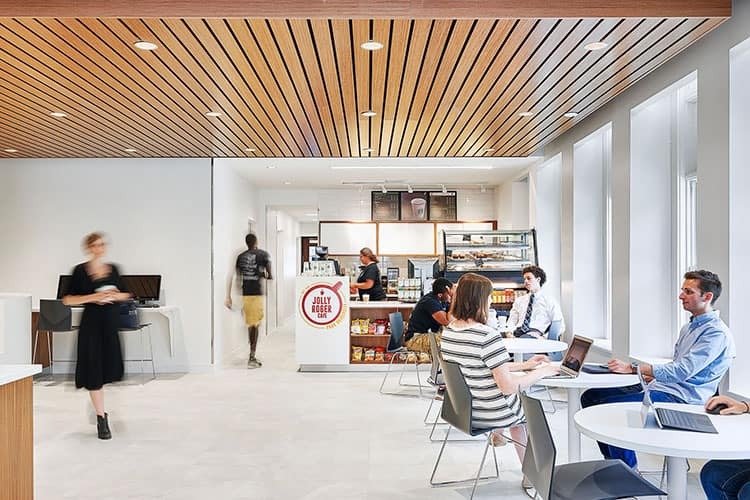 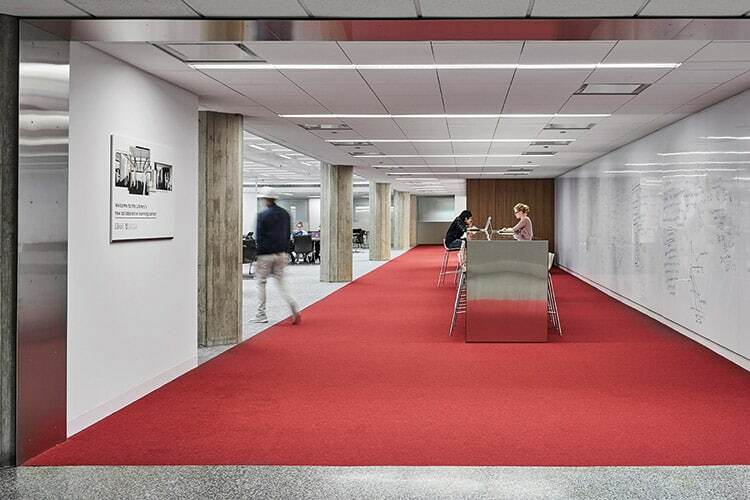 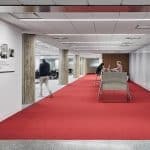 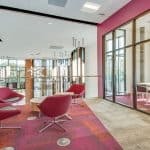 The renovation maintains the red-brick exterior while updating the inside with raised access flooring, flexible meeting spaces, collaborative work areas, and a quiet reading room with a fireplace. 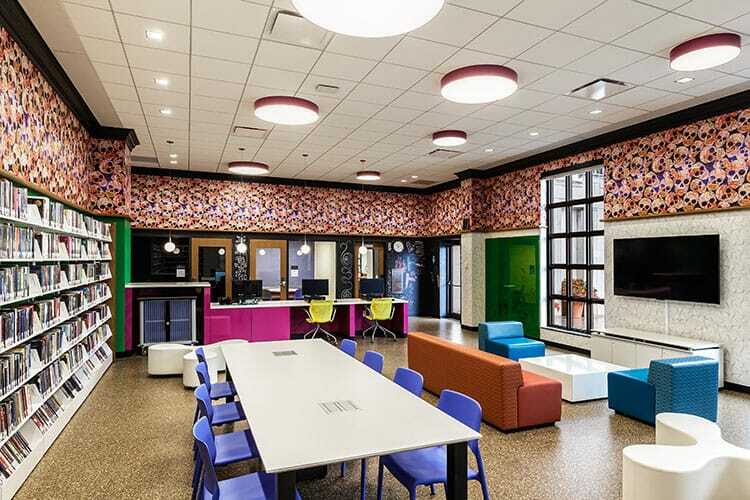 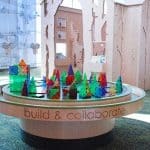 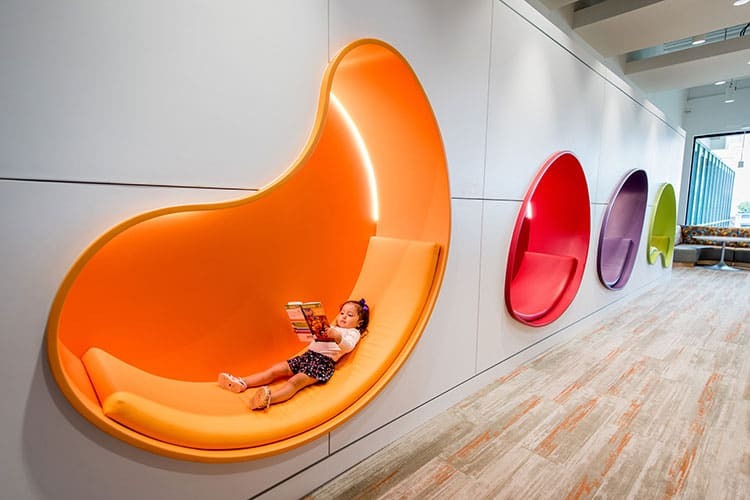 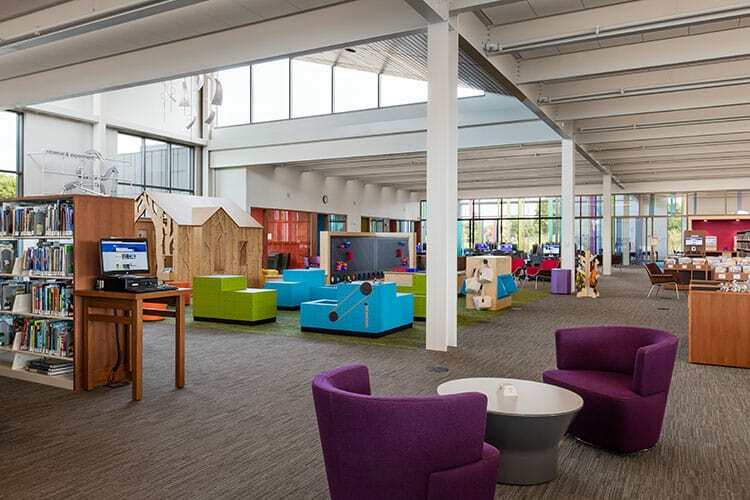 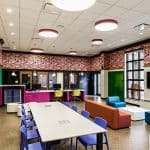 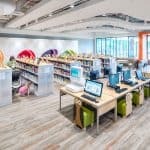 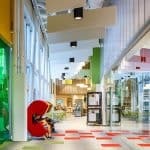 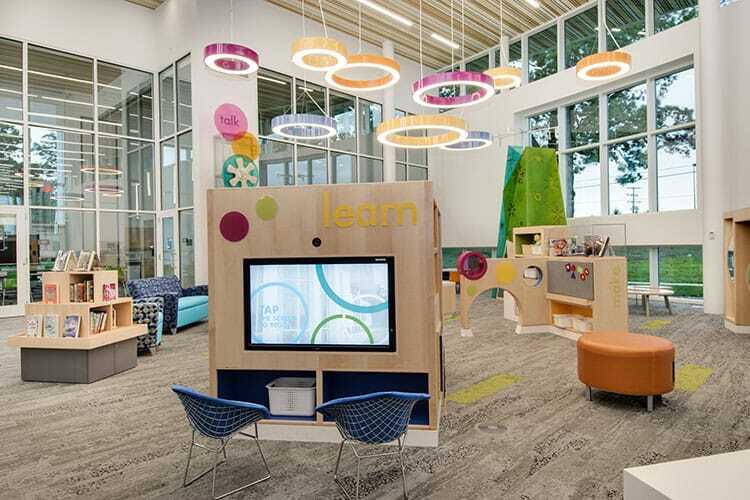 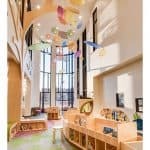 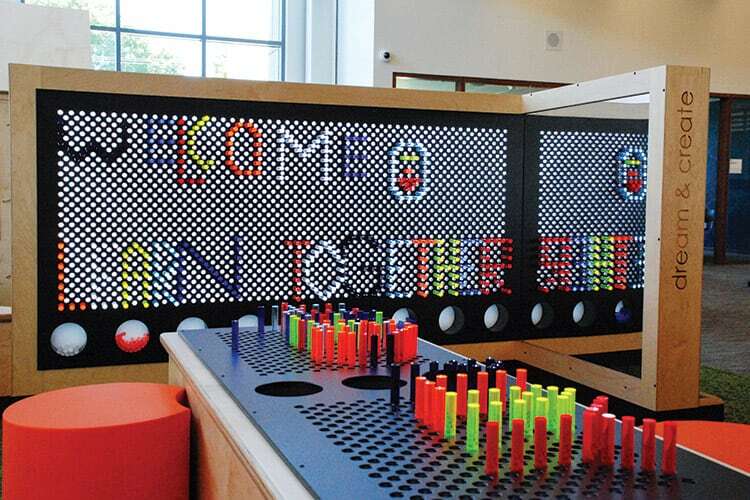 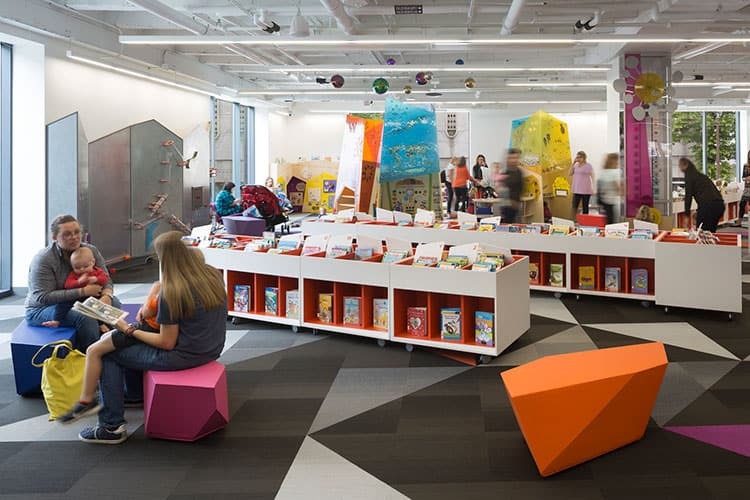 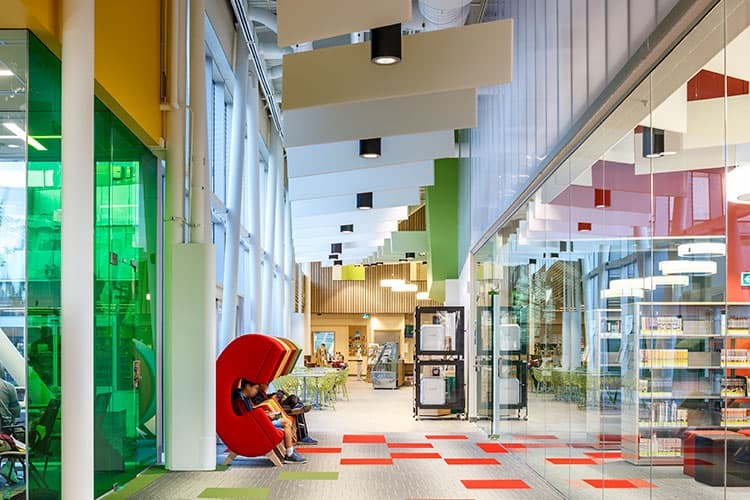 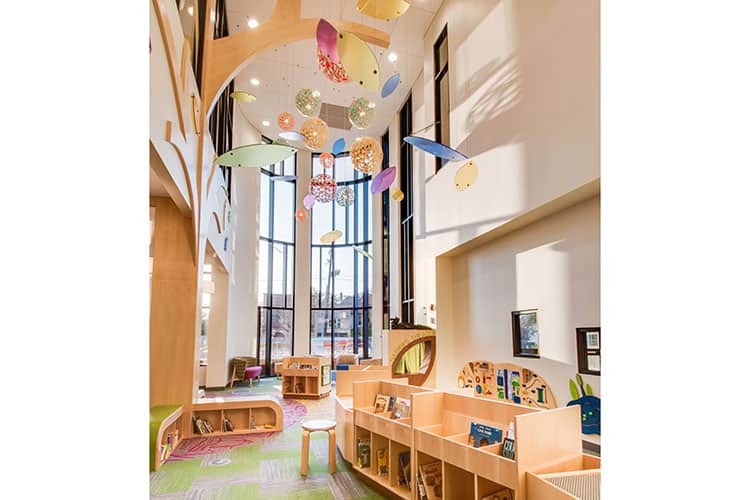 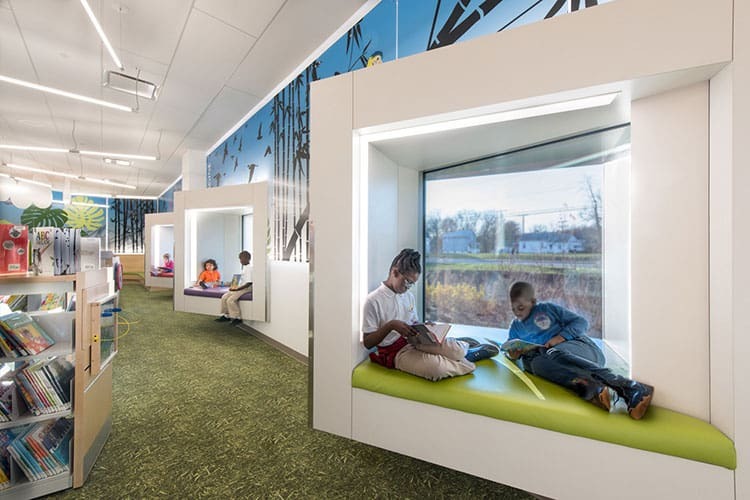 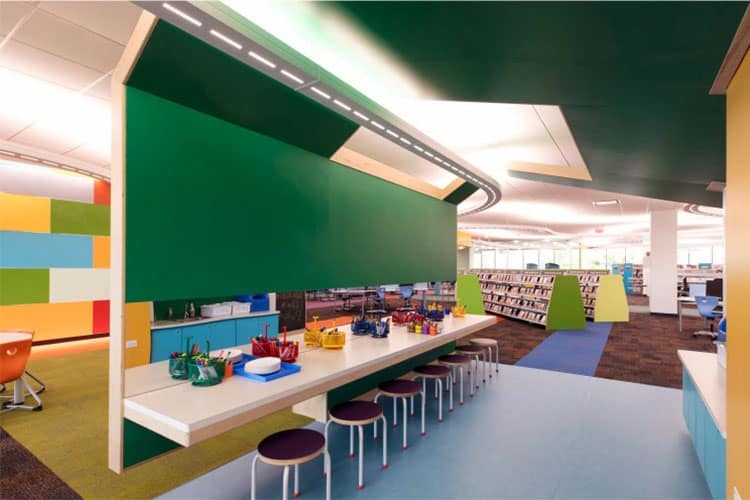 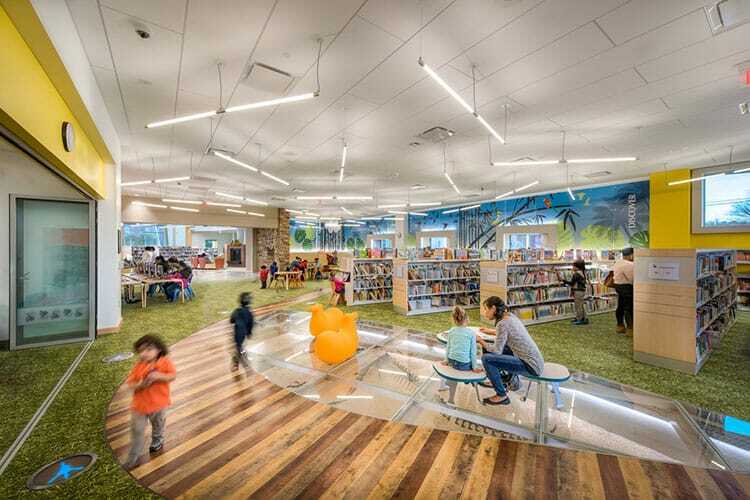 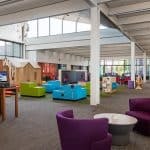 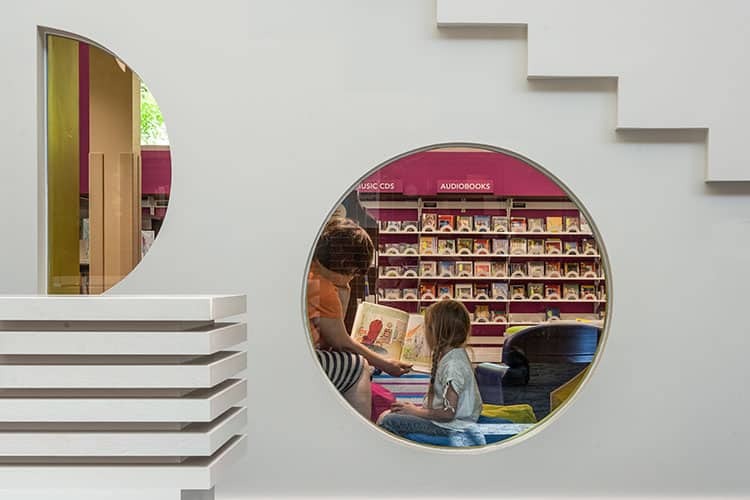 The Brooklyn Park Library’s Family Play and Learning Space was designed to inspire and spark young minds. 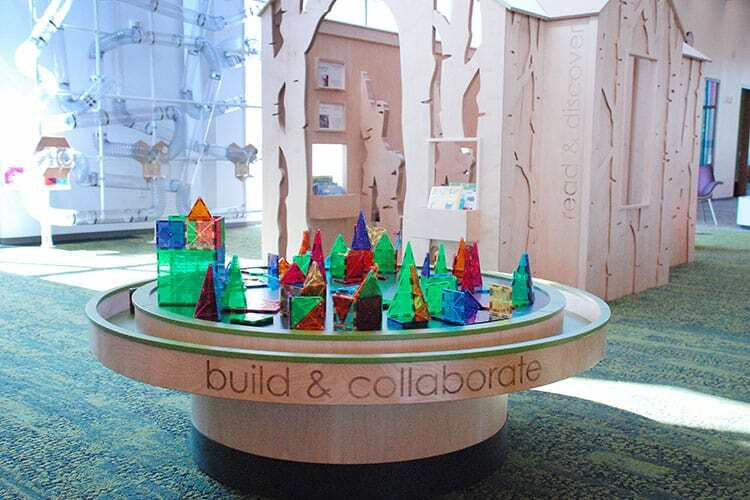 The area features a giant microscope, wind tunnel, engineering challenge cubes, and other hands-on stations for kids to learn and experiment. 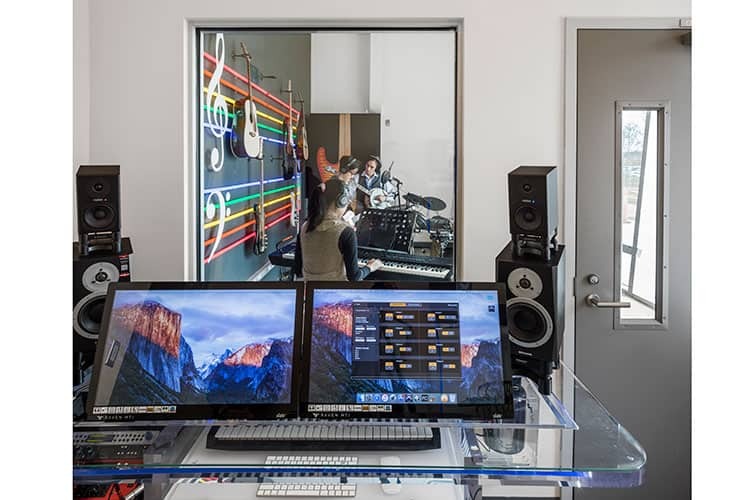 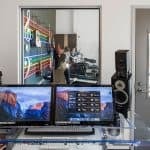 A teen-focused tech center offers a multimedia suite with audio recording, graphic design, animation, and coding capabilities. 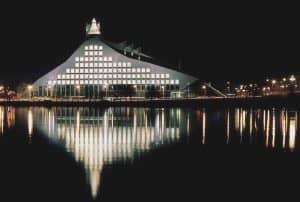 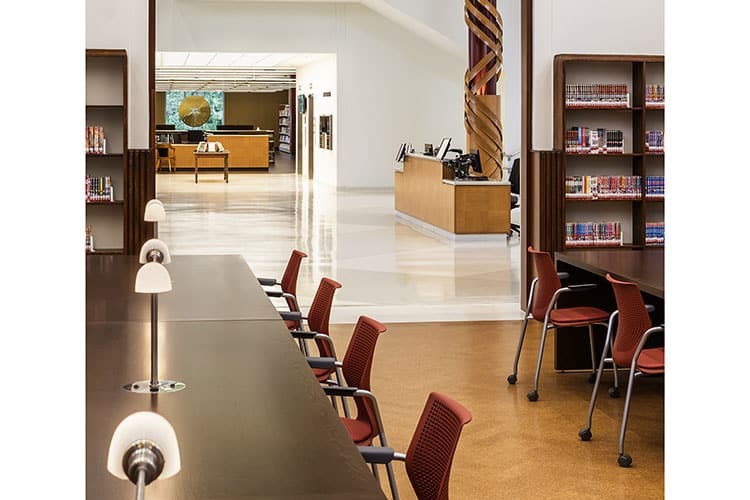 Built in 1965, the flagship Central Library was renovated and expanded to become a modern urban destination with glass study cubes, an interactive education center, a makerspace with a recording studio, and a full-service café. 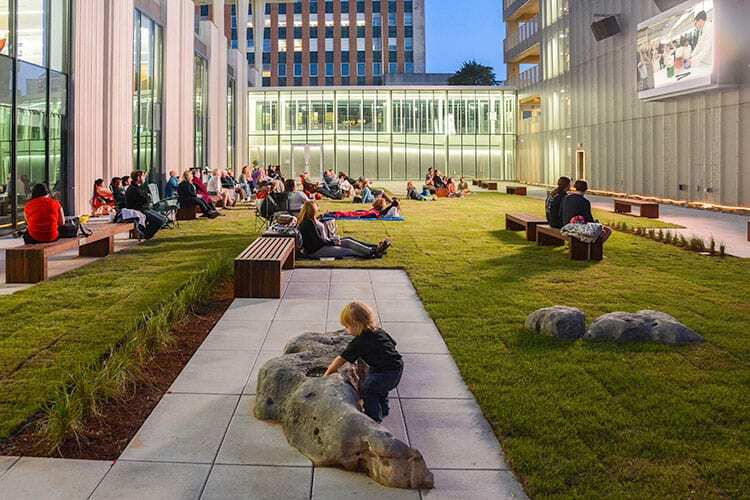 A new outdoor garden and revitalized civic plaza help bring the library even further into the community. 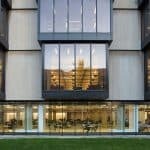 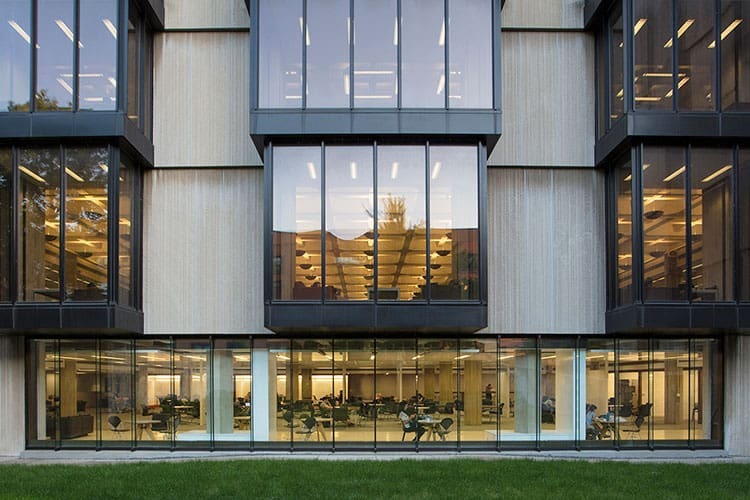 The Regenstein Library’s renovation adds a crucial component of modern academic spaces to the Brutalist complex: collaborative learning areas. 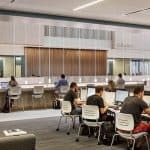 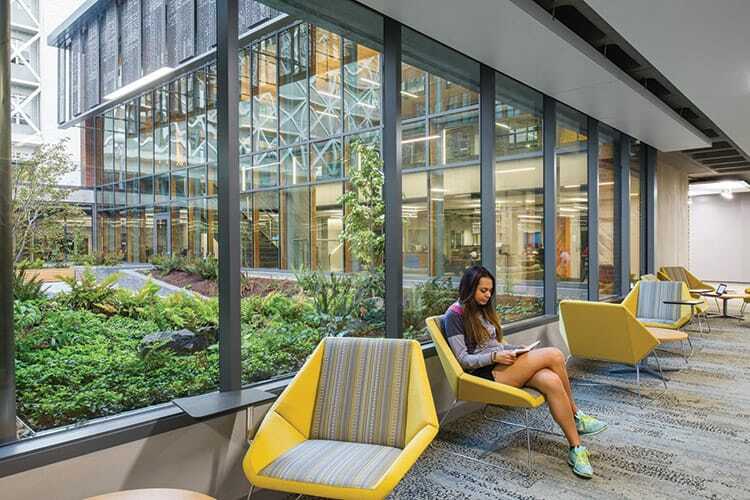 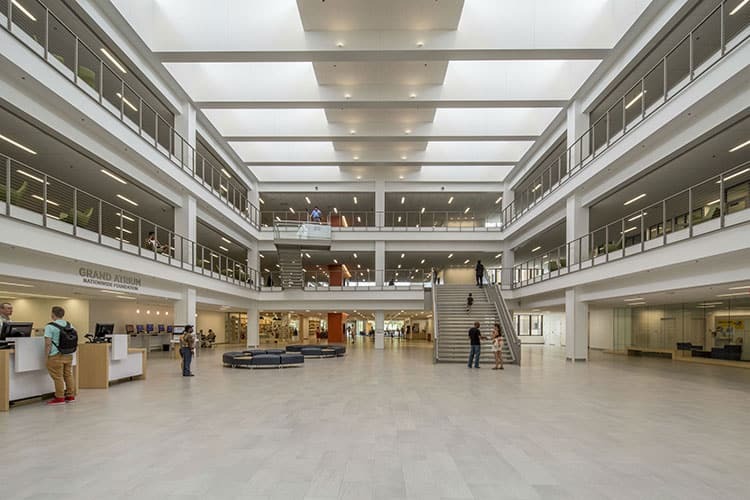 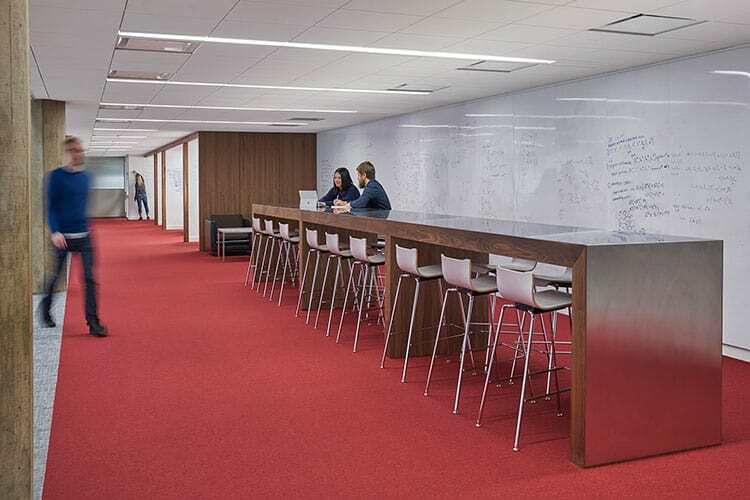 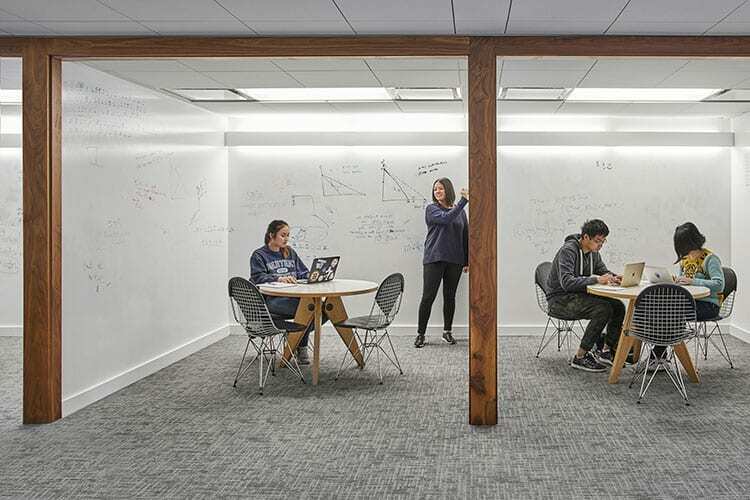 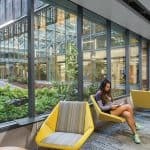 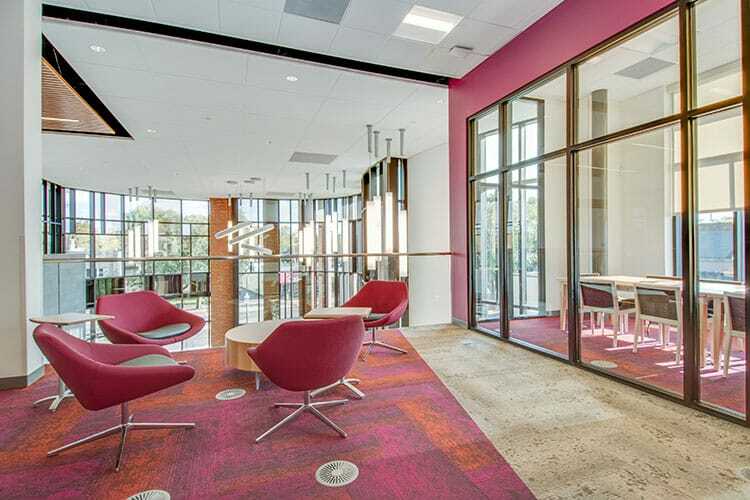 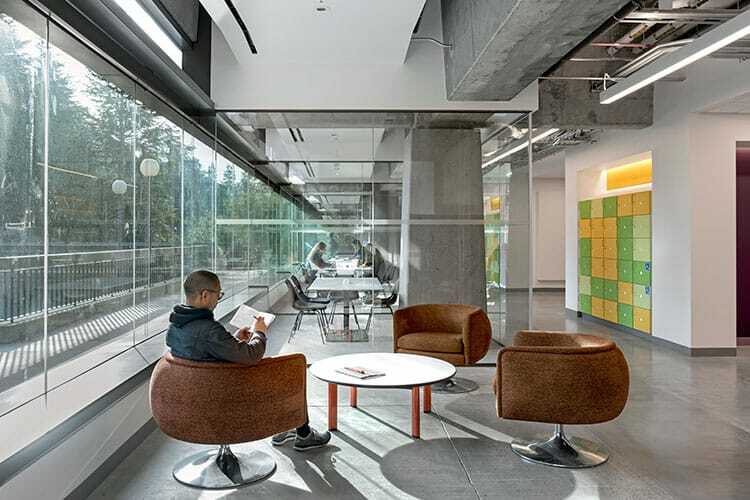 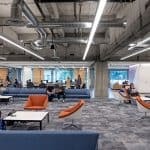 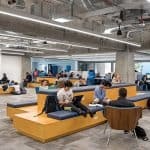 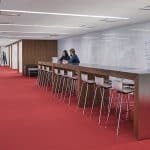 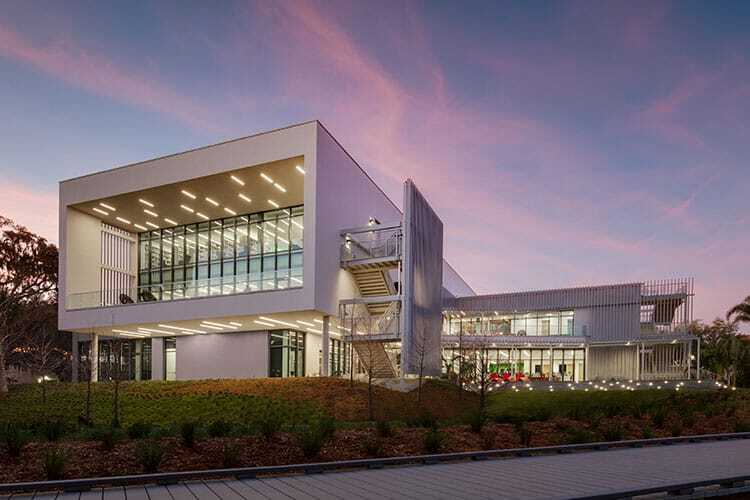 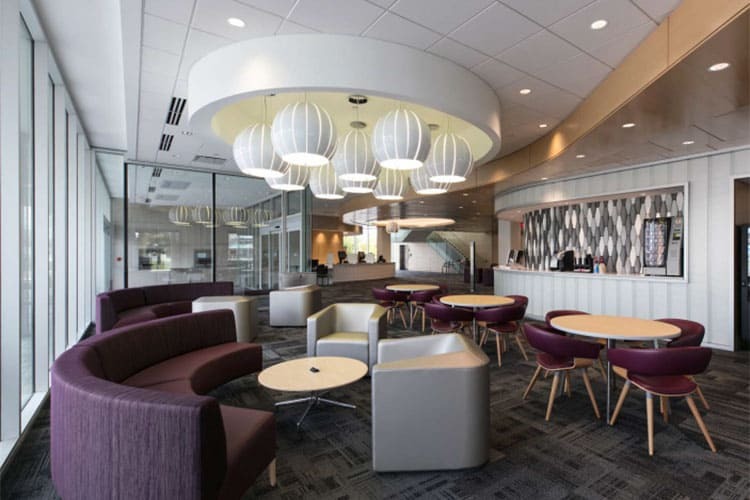 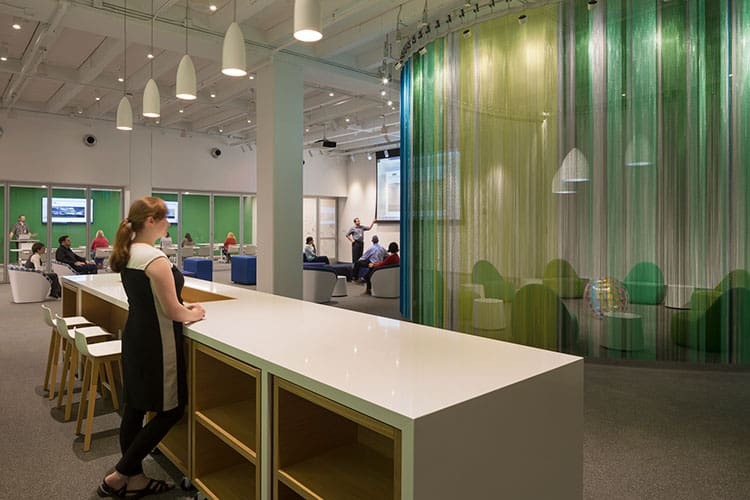 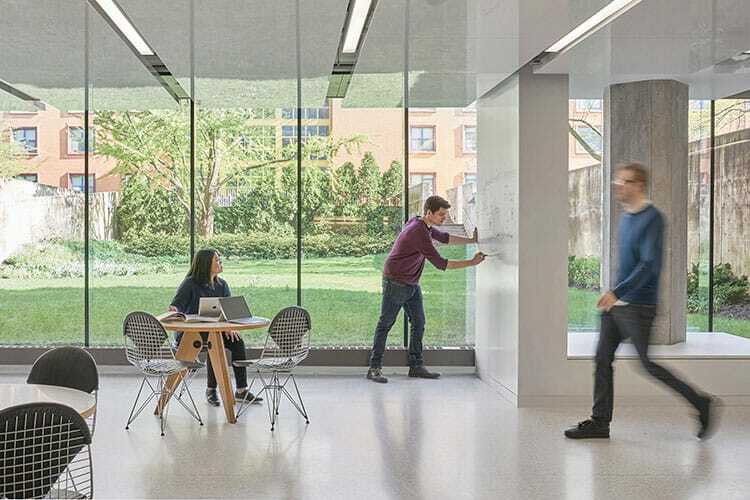 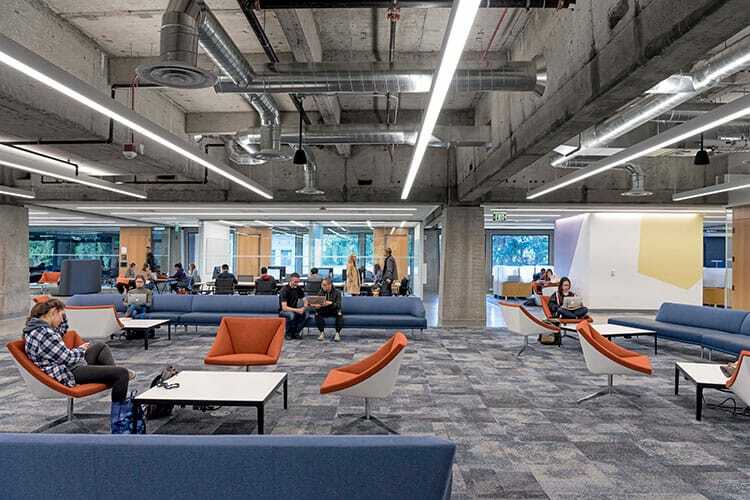 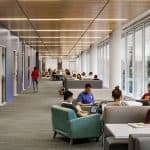 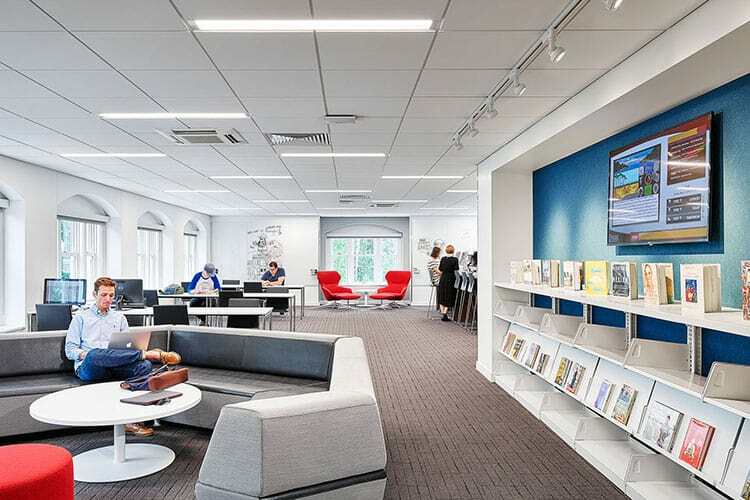 Once filled with cubicles, the library’s central zone is now a flexible, open space that can be divided by movable panels fitted with whiteboards, lighting, and power connections. 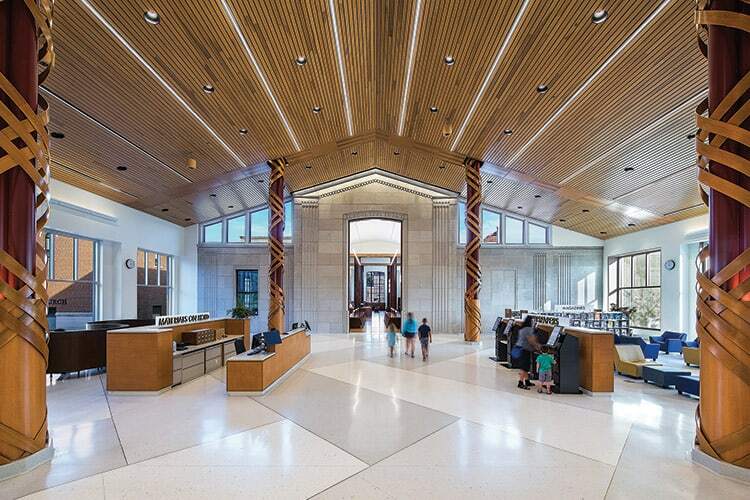 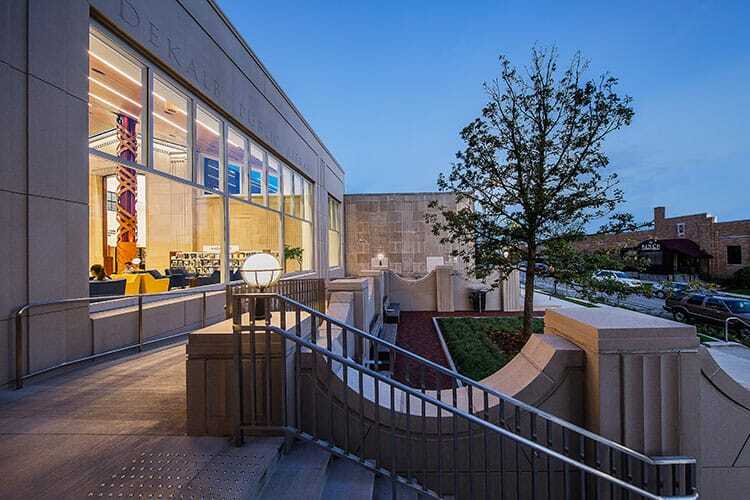 DeKalb Public Library updated its Art Deco building without sacrificing any of the details and charm that placed it on the National Register of Historic Places. 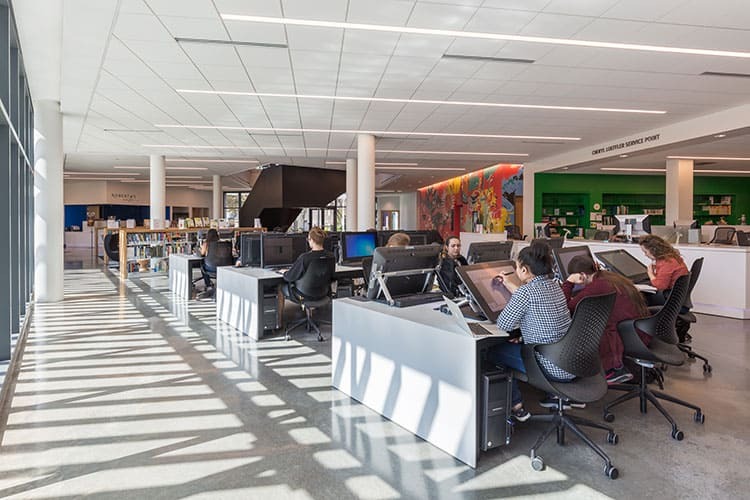 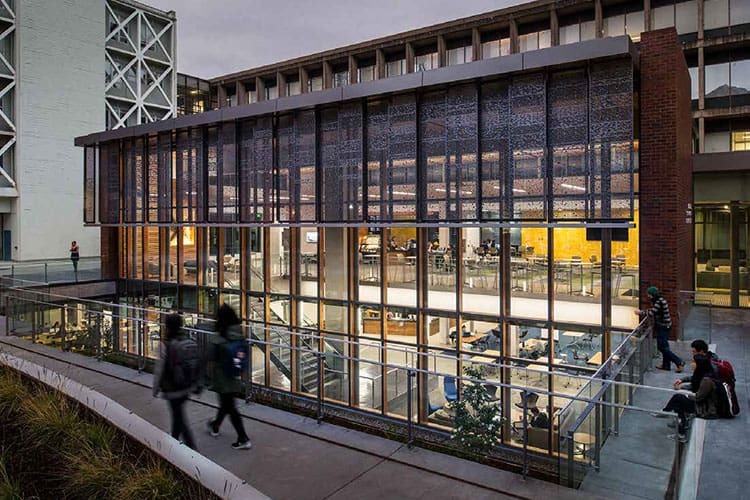 The library was expanded by more than three times its original size, adding room for event and study spaces, a teen area with game systems, and a collaborative classroom with 3D printers and a laser cutter. 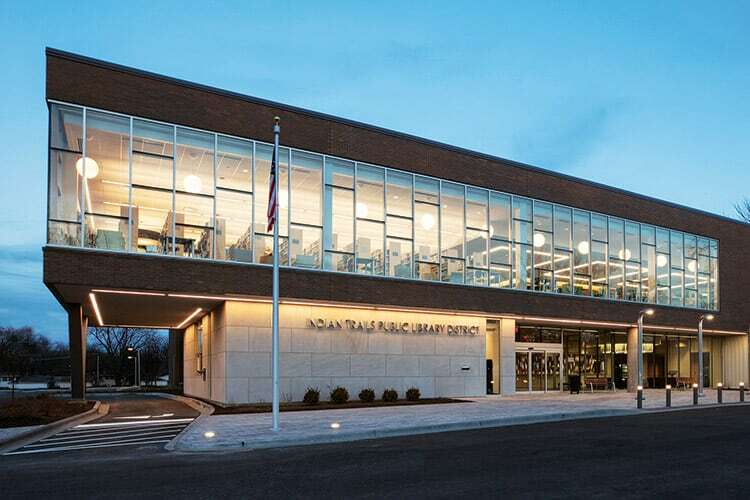 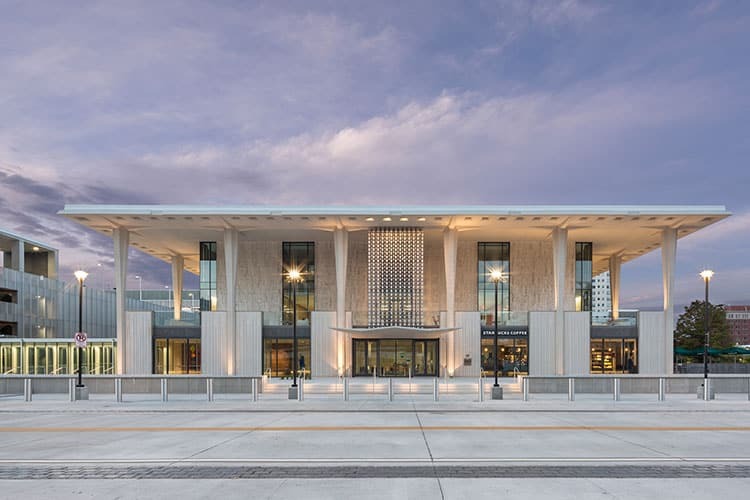 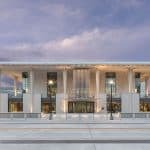 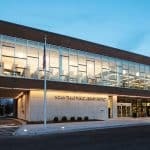 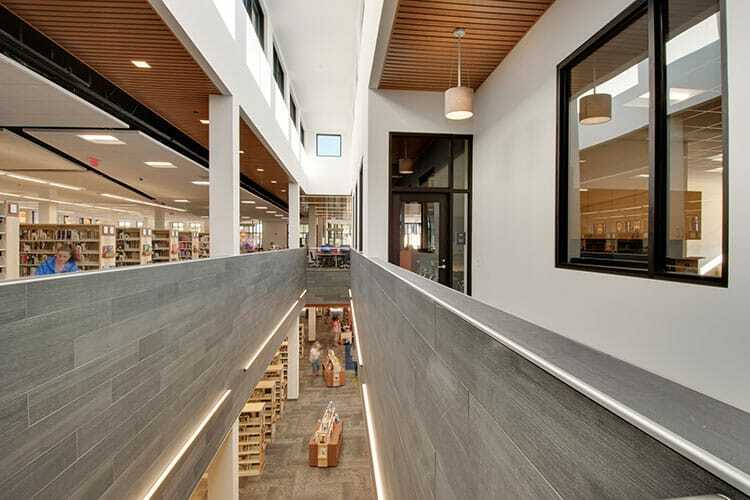 The Main Library’s renovation included replacing the original marble exterior with walls of glass that allow natural light to fill the building and transforming a parking lot into an outdoor plaza. 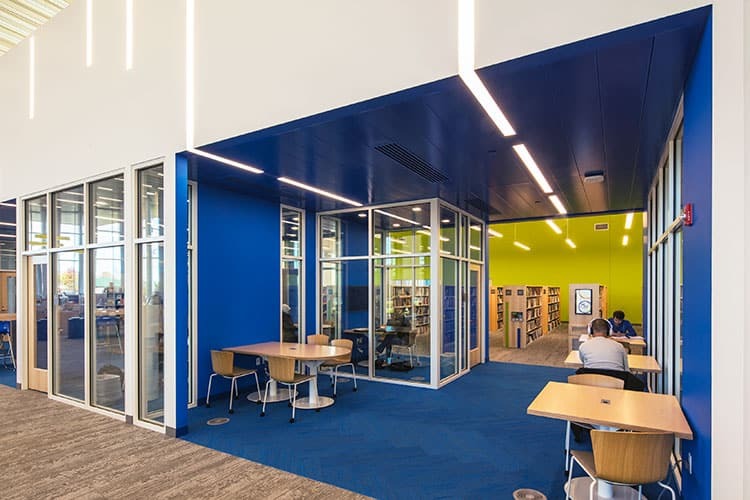 Inside, a new two-story reading room provides ample space for patrons to spread out and can serve as an area to host large events. 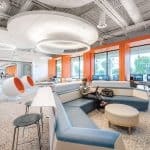 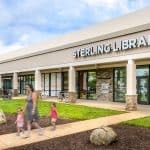 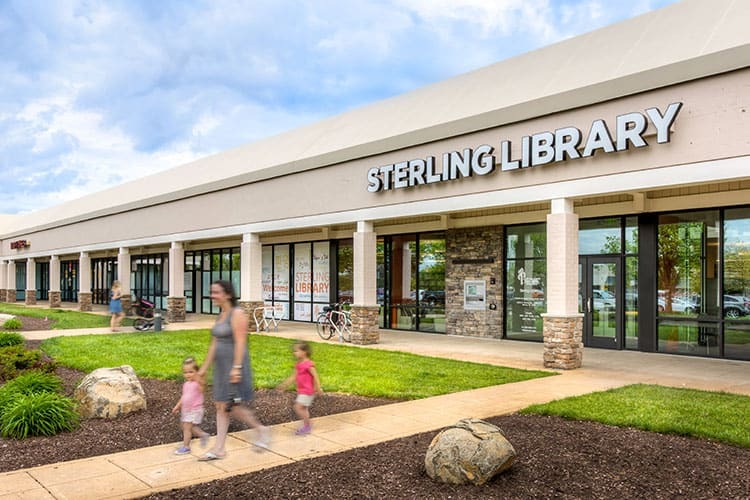 A vacant space in a shopping center was tranformed into a state-of-the-art facility for the city of Sterling, Virginia. 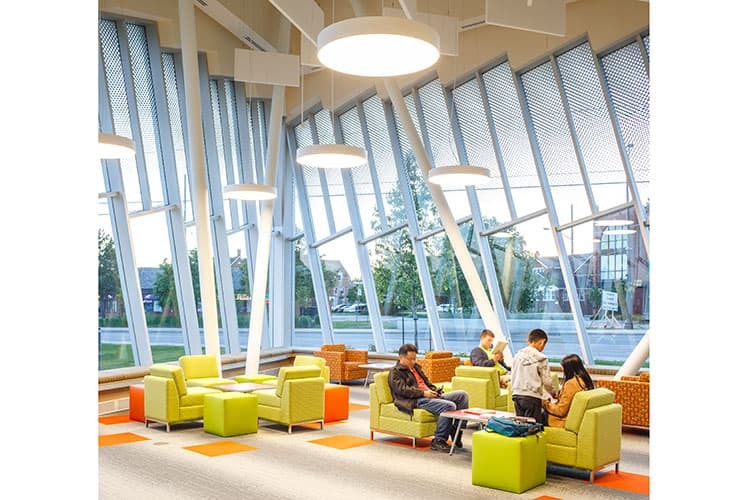 Tubular skylights, storefront glass, and LED lighting create a warm environment for patrons using the digital lab, 3D printer, and recording booth in the makerspace and the wide-screen gaming television. 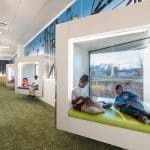 Glass-enclosed meeting rooms allow groups to work without disruption, and reading pods provide quiet spaces for readers. 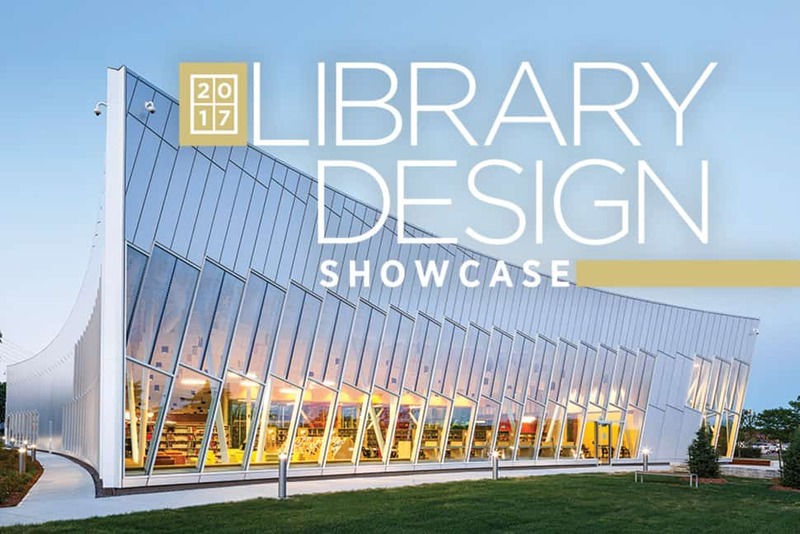 Welcome to the 2017 Library Design Showcase, American Libraries’ annual celebration of new and renovated libraries. 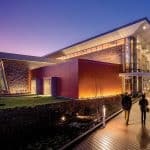 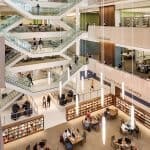 These are shining examples of innovative architectural feats that address user needs in unique, interesting, and effective ways. 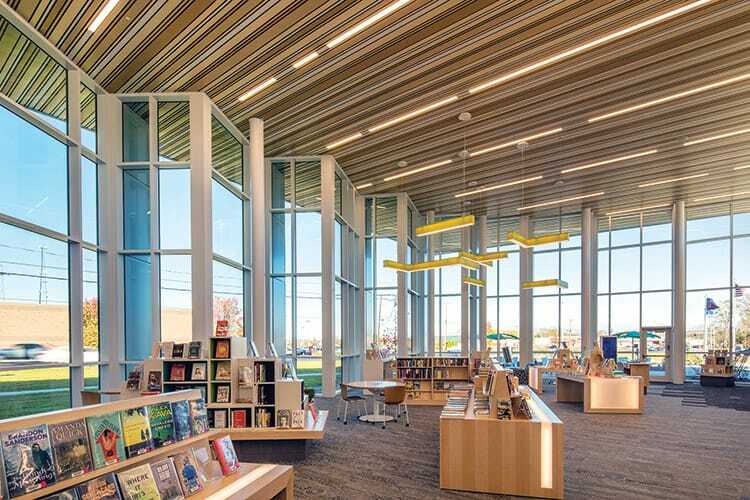 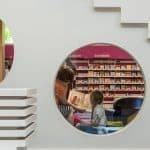 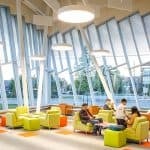 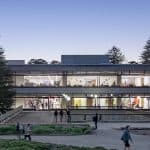 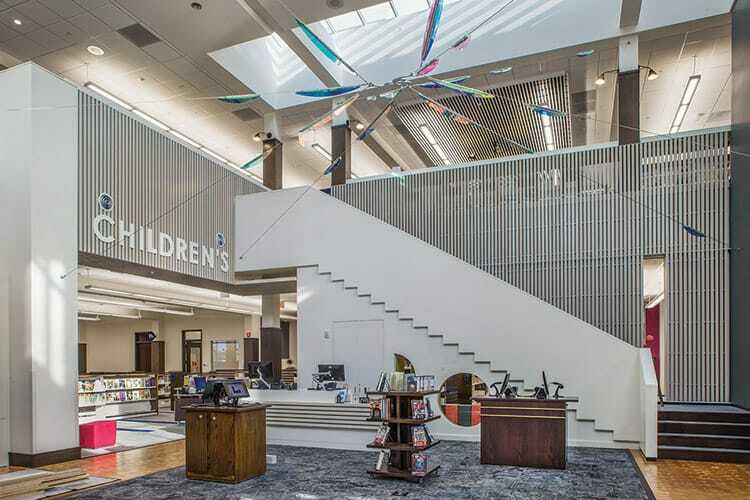 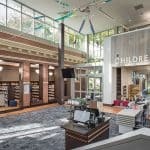 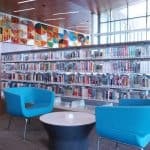 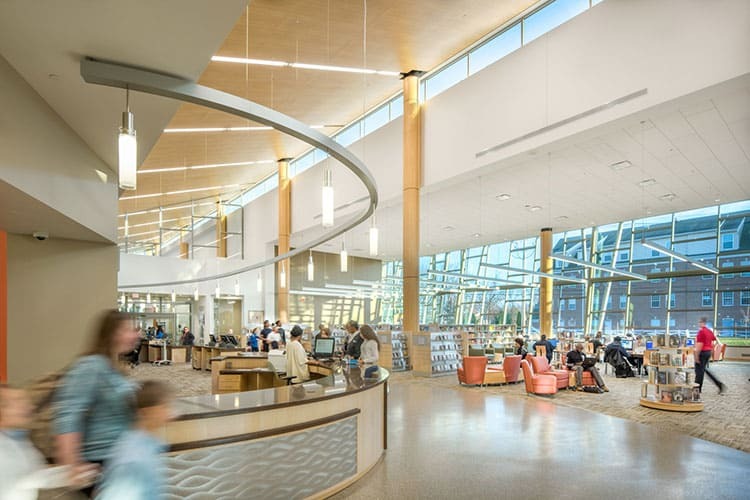 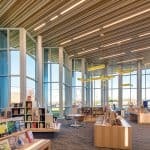 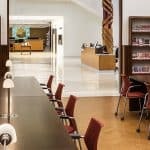 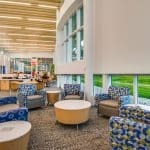 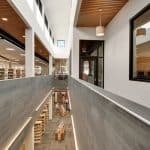 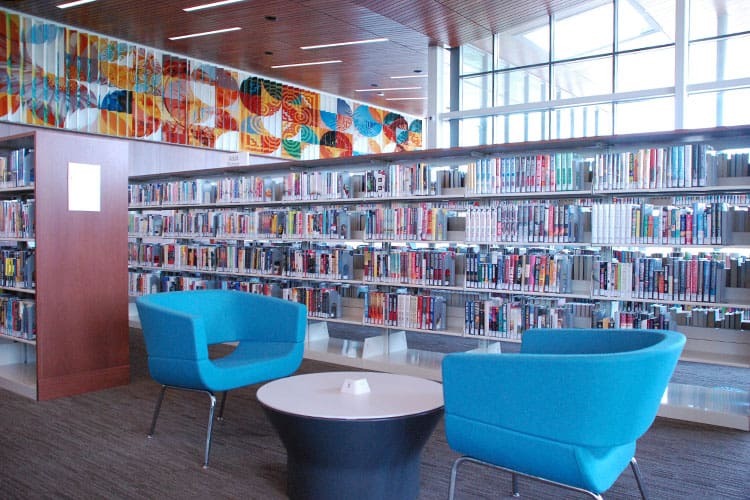 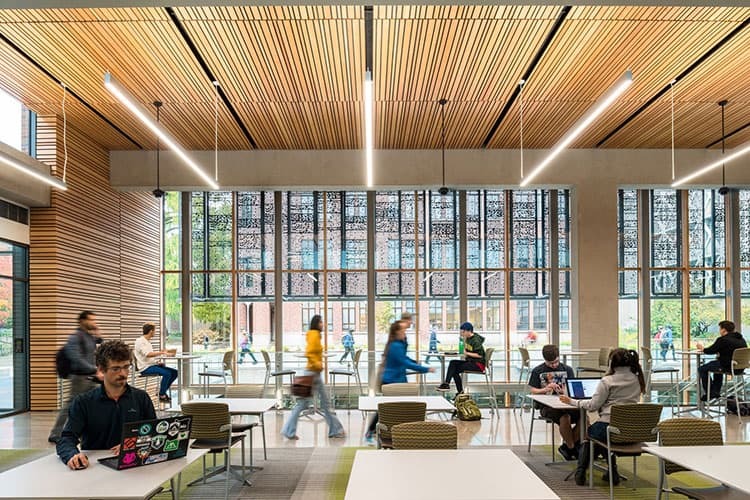 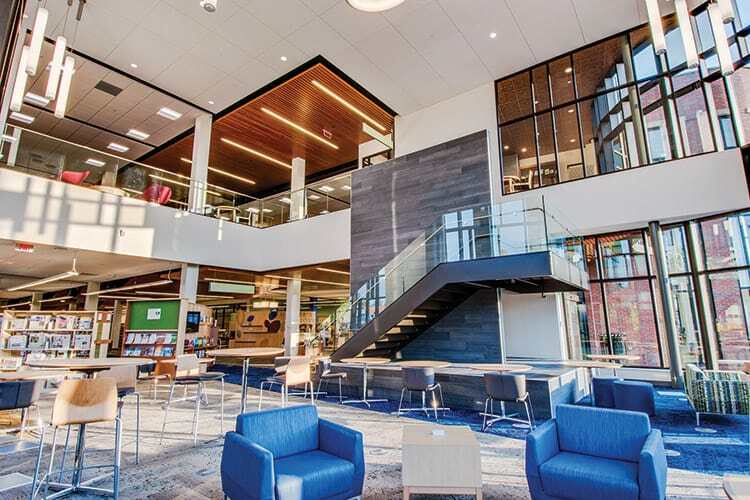 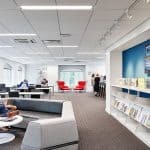 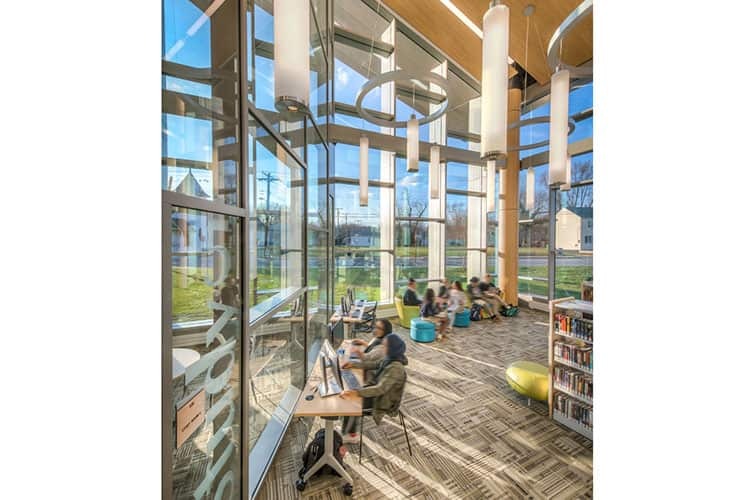 Renovations and expansions dominated this year, showing that libraries are holding on to and breathing new life into spaces already cherished by their communities.